My spine fractures are still healing so I am not kitesurfing yet, but I am mobile. I headed down to Hampton to give my friend Stu Styles some tips and assistance with his kitesurfing. Stu is adding kitesurfing to his water sports and is an accomplished surfer and windsurfer. I rigged up a marine UHF radio for him but it got in the way of his harness so we took it off. Stu has finished lessons and is now on the quest to get going and upwind. He did exceptionally well and got up and going on his strong (natural) side, along with some water starts on his unnatural stance side. After the water start and the first dive of the kite, let the bar out half way to give the kite some air and generate more pull and water speed. Keeping the bar right in tends to "choke the kite" after a water start - you then lose speed and sink back in to the water. The debrief. 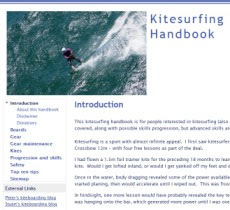 Kitesurfing vs windsurfing? This video is worth watching to see the upper limits of kitesurfing huge waves. Jesse Richman and Patri McLaughlin kitesurfing giant waves at Maui, Hawaii's famous surf break, Pe'ahi (Jaws). I have just had a serious accident that put me in hospital, but not from kitesurfing. I slipped near the top of the ladder then pitched forward to the adjacent shed porch roof. I then flipped back off the roof and landed on the my back on the ground. I hit the lower back of my head hard on a concrete block retaining wall but stayed conscious. My lower back hit something else, possible the brick porch - this caused intense pain. The bee hive above our water tank. I yelled out on the ground but nobody could hear me. I decided to push through the back pain and got onto all fours then my feet and walked back into the house. Lena immediately checked me out as I lay on the floor. When I tried to get up I had bad spasm and intense back pain so I couldn't walk to the car. Stuart came around to help and put some cushions under me. The ambulance showed up They couldn't get their stretcher up the steps in our house so they but a drip in my wrist and gave me some morphine, after which I was able to walk with assistance to the stretcher. They checked me out in the Emergency department of the Epworth - the CT scan showed I had two fractured transverse processes - the bone flanges that protrude off the lower vertebrae. The good news was the main vertebrae, spinal chord and kidneys were all OK, so it could have been much worse. 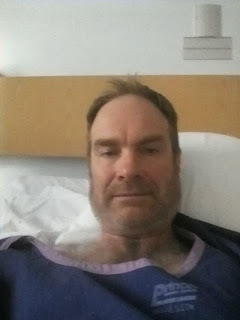 I was in hospital for two an a half days, cursing that I was out of action for the upcoming second Across the Bay in a Day kitesurfing crossing. James and Simon called by to visit on the last day which cheered me up a lot. After a final CT scan to check there were no issues with my head I left the hospital, gingerly sitting in the car with large packets of Panadol Osteo and some Ibuprofen. I had a lot of pain the first couple of days and kept the pain killers up. A short walk to the local shops was an epic outing. After about 5 days I was feeling much better - the pain had subsided, although there is still a large tender region to the left of my spine. I got some calcium powder and Injury and Bruising cream (Arnica, Calendula, Hypericum and Lavender) from Dartnell's Pharmacy and have been using them. I am now also able to drive the car for about 30 minutes. While its very frustrating to be out of action (cabin fever set in on day 1!) I am also very grateful that I was not more seriously injured and that the pain has greatly diminished. Oakton, my employer, has been very accommodating too. Apparently over 50% of serious domestic accidents involve ladders. So I am now part of this 50%. My major (re)learning is that ladders are VERY dangerous and that you should use them with extreme caution, preferably with someone else nearby. I will hopefully be kitesurfing in around 6 to 8 weeks - the time it will take for the fractures to fully heal. Thanks to all of you that have provided me with your best wishes and support - it is greatly appreciated. So I think more kitesurfing and cycling is indicated, rather than dangerous domestic duties around the house . . .
Kitesurfing variable westerly wind at Hampton. Session 277. Early session at Hampton with Stuart. Strong westerly wind when I arrived so I took out my Lithium 9 and was well powered and surfing some nice waves on the main beach. The wind dropped after 30 minutes so I swapped my 9 for my Lithium 12 and got some more runs in. I tried some duck tacks again without success. The wind dropped again so I came in and packed up. The wind was up and down all day ranging from 10 knots to 35! This is more like frontal winter winds than summer wind. I skipped the training downwinder from Aspendale to Port Melbourne due to family commitments. Cesar and 5 others made it to Port Melbourne but many others didn't go the full distance. They had to deal with sections of not enough wind (10-15 knots) to gusts of 35 knots - very tricky conditions. Session 276. Not really a session. Got down to Gnotuk Ave around 3:30pm with some good wind shown on Baywinds. However, it conked out just as I arrived and all the kites that were out came right in. It dropped to around 10 knots so I headed out on my Lithium 12 with the Sector 60. I got going, just, but then turned around and struggled to make it back to shore. I chatted with Stuart and some other kiters while waiting on the beach for more wind, but none came. It was a strange day for wind as Predictwind had forecast a south easterly but there was good westerlies blowing to the south and the west. It was a bit frustrating but at least I got wet. Session 275. Light winds prevailed during the day, I headed to Mentone late in the day to see if the South Easterly was coming in there. It was, but only around 15 knots, so I setup my Lithium 12 and took out the Sector 60 board for my first kitesurfing session of the new year. I did a run across close to the Beaumaris Motor Yacht Squadron, then a long tack towards Mordialloc up close to the pier. The return tack was bearing off Ricketts Point so I decided to go there. Half way I realised my GPS was off so I turned it on. No other sailing craft about - it was almost spooky. There were a couple of boats fishing close to Ricketts Point. The evening light as nice, and I was able to maintain a good speed on the magnificent Sector 60, the secret to this session. On the turn leg I was bearing towards the Mordialloc Pier but I decided to head closer in and do some downloops and ride the swell. Going downwind I the kite touched the water and stayed down. It took me a little while to get it relaunched, then I headed in with the wind dropping a bit. A really nice solitary session.